Jakarta, April 10 : The Asian Team heroes of the EurAsia Cup, including Anirban Lahiri of India, will grace the Asian Tour Awards night here April 22 while compatriot Jeev Milkha Singh is in the running for the Asian Tour’s Player of the Decade award. The Asian Tour Awards night will honour the achievers of the 2013 season and will also include a time of recognition for members of Team Asia who battled magnificently to share the inaugural EurAsia Cup trophy with Team Europe. Kuala Lumpur, March 21 : India's top golfer Jeev Milkha Singh is in the running for the maiden Player of the Decade award (2004-2013) of the Asian Tour at its Awards Night in Jakarta on April 22. Besides Singh, the other golfers who have been nominated for the for the Player of the Decade award, which is voted by the Asian Tour members, are Thai duo Thongchai Jaidee and Thaworn Wiratchant. Korea's K. J. Choi and Y. E. Yang, the first male Asian golfer to win a Major title, are the other nominees. The Player of the Decade title has been created by the Asian Tour to celebrate its 10th season in 2013. New Delhi, Feb 7 : Jeev Milkha Singh will again spearhead the home challenge at the fourth edition of the Avantha Masters, which will be played March 14-17 at a new venue, Jaypee Greens Golf Course in Greater Noida near here. Singh is India's most successful golfer, having accrued a total of four European Tour titles including last year's Aberdeen Asset Management Scottish Open. He is also a two-time Asian Tour Order of Merit winner. Indian star golfer Jeev Milkha Singh has carded level-par 72 in the second round as he slipped down to joint 10th place in the Dubai Desert Classic (DDC) golf tournament at the Majlis golf course in Dubai on Friday. 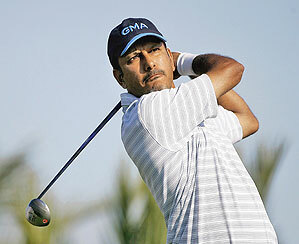 Jeev, the overnight leader, scored three birdies and three bogeys in the second round. Jeev trailed by four strokes from the leader Thongchai Jaidee (66) of Thailand with a total of four under 140. Jeev carded birdie on the 12th hole but bogey at the 17th hole took him to even par. Jeev Milkha Singh is very optimistic for Tiger Woods to grow to top in three months time. Jeev, who has been named the brand ambassador of the US based sports goods company Callaway, described Woods as a very capable player, who won’t be remaining in oblivion for long. “I cannot comment on his (Woods) personal life. But he is a fantastic player. I think in the next three months, he’ll be back with a bang. He will surely go on top once he makes a comeback,” said Jeev, when asked to comment on Woods’ personal problems. Jeev would also be playing in the 2016 Olympics in Brazil, and said that though there is still much time left for it, he is happy that golf has been included in Olympics. Chonburi (Thailand), Jan 9 : Indian golfers Jeev Milkha Singh and Gagangjeet Bhullar were outplayed 4 and 3 by Colin Montgomerie and Simon Dyson in the fourballs as Europe stormed back into lead in the annual Royal Trophy golf tournament. Europe won three of the four matches in fourballs on the second day and took the lead 4 and a half to 3 and a half after Asia had taken a one point lead at 2 and a half to 1 and a half on the first day. The eight singles matches will be held Sunday. Jeev and Bhullar, who played splendidly on the first day to halve their match with Peter Hanson and Soren Kjeldsen were unable to replicate the same form, while Montgomerie and Dyson, who had lost their respective matches in foursomes on Friday, were in superb form. Tokyo, Dec 5 : Defending champion Jeev Milkha Singh putted like a dream with a five-under 65 that brought him back into contention at the season-ending Nippon Series JT Cup golf here Saturday. Jeev, who won the title in 2006 and 2008 and finished third in between in 2007, was at five-under 205 at tied second, two shots behind South Korea's Kim Kyung Tae, who shot a sizzling six-under 64. Jeev shares the second place with Toshinori Muto (66) and the duo are two shots clear of overnight leader and now fourth placed Shigeki Maruyama (70), a past champion here. Tokyo, Dec 4 : Three birdies on the back nine hauled Jeev Milkha Singh back into the picture as he moved up to tied seventh and just four shots behind the leader at the midway stage of the season-ending Nippon Series JT Cup golf Friday. Jeev, tenth overnight, was one-over through 10th, but then birdied 11th, 14th and 17th with a bogey in between on the 13th for a round of 69 at the Tokyo Yomiuri Country Club. Former US Tour player Shigeki Maruyama moved into the lead with three-under 67 that brought him to three-under 137. He is one clear of Tomohiro Kondo (67). Shenzhen (China), Nov 28 : Jeev Milkha Singh and Jyoti Randhawa delivered a seven-under 65, their best round of the week but still felt they left far too much out on the course on the third day of the Omega Mission Hills World Cup golf here Saturday. Despite their lip-outs and near-misses, they are now 16-under and tied for ninth, two down from overnight seventh. India are the second best Asian team after Japan, who at 19-under after a third round 64, are tied fourth with South Africa (62). Shenzhen (China), Nov 27 : Jeev Milkha Singh and Jyoti Randhawa combined superbly to birdie each of the five par-fives and bring home a four-under 68 that kept them in the hunt for a finish in top-five of the Omega Mission Hills World Cup golf at the Jose Olazabal course here Friday. On the course which has five each of par-fives and par-threes on the par-72 layout besides the usual eight par fours, the Indian pair, who were unable to play a practice round together because of a delay in Randhawa's visa, are now nine-under for two days and in tied seventh place. Shenzhen (China), Nov 25 : Jeev Milkha Singh and Jyoti Randhawa are all set to represent India at the 2009 World Cup of Golf at the Mission Hills Golf Club starting here Thursday. Jeev, currently ranked 57 in the official world golf rankings, earned the direct berth for India by virtue of his ranking. Jyoti will partner Jeev at this mega-event. Dubai, Nov 21 : A much-improved performance with the putter made all the difference as Jeev Milkha Singh despite two bogeys came back with a four-under 68 that saw him move up from tied 22nd to 15th at the end of the third round of the Dubai World Championships golf here Saturday. Jeev at six-under 210 is nine shots behind leader Lee Westwood (66) but a good final round could easily get the Indian into top-10 as he is only three behind sixth-placed duo, Geoff Ogilvy (68) and Sergio Garcia (69). Dubai, Nov 19 : Jeev Milkha Singh poured in a tense 15-footer for par at the end of two-under 70 round and that kept him in a tie for 14th at the inaugural Dubai World Championships here Thursday. It may only be the first of the four days, but the inaugural Dubai World Championships is turning out to be everything it promised and more. Dubai, Nov 18 : Indian golfer Jeev Milkha Singh is looking to end the European Tour in style with an impressive finish at the Dubai World Championships starting here Thursday. At the breathtaking Earth golf course here, Jeevd played the Pro-Am Tuesday was back at the course Wednesday morning for some practice. "I love the layout and had a good look at it. I hope I can round off the European Tour season in style," said Jeev, who will tee of with Rafael Cabrera-Bello in the first round. Dubai, Nov 17 : It has been a mixed season for Jeev Milkha Singh, who Thursday will tee off at the inaugural Dubai World Championships, which signals the end of the European Tour season. It has been a season, during which Jeev despite a fall in his World Golf Rankings ensured a ticket to the US PGA Tour for 2010. The full playing rights were confirmed at the end of the final US Tour event last week at the end of the WGC-HSBC Champions and last of the Fall series events, the Children's Miracle Network Classic in Florida. Casares, Spain, Oct 31- A back-nine fightback by Jeev Milkha Singh fell just a bit short and he missed making the semi-finals of the Volvo World Match Play championships on Friday. Jeev, who at one stage fell four holes behind Ross Fisher after 10 holes, narrowed the gap down to just two with two holes to go. A missed putt on 17th ended his hopes despite the birdie which further reduced the gap to just one. Fisher's one hole win earned him a second victory and with four points he topped the pool and moved into last four. Casares (Spain), Oct 30 - Playing through pain, India's Jeev Milkha Singh made a sensational debut Thursday at the Volvo World Match Play Championships by stunning European Money leader Lee Westwood, the world number five by a whopping six holes at the Finca Cortesin course, west of M? laga. The Indian star, who is battling an ankle injury and also gave up his defence of the Singapore Open being played halfway across the world, still has two more matches, against Camilo Villegaes and Ross Fisher left in his group. Sentosa, Oct 28 : Jeev Milkha Singh, the defending champion, is not here but the pair Ernie Els and Padraig Harrington whom he beat in a nerve-tingling finish last year are back aiming for glory this time at the star-studded $5 million Barclays Singapore Open golf. Three-time major champions Harrington and Els are aiming to go one better in this week after having missed make-able birdie putts on the final hole that would have forced a play-off with champion Jeev. Casares (Spain), Oct 27 : Jeev Milkha Singh adds another feather to his well-adorned cap as he becomes the first Indian to tee up at the 16-man World Matchplay Championships Thursday. The Asian Tour No. 1 Jeev, who took a week off to rest his ailing ankle, said: "The field is absolutely world class and it will be good to play against them in match play." Wearing incorrect footwear may have preoccupied Jeev Milkha Singh last week as he descended on the driving range of Las Vegas's TPC Summerlin, ahead of the Justin Timberlake Shriners Hospitals for Children Open. But the brush with Timberlake, the host and celebrated singer, not only made the world No. 52 forget his woes momentarily; the meeting left him “wiser”. “It was Wednesday, the day of the pro-am, and I was at the range when Justin came up to me, shook my hand and thanked me for turning up. Soon after, he approached every pro there and acknowledged their participation,” Jeev told HT.